Many workers can fall into the vicious cycle of putting their job over their health. Staying up late, working during lunch, and never getting a break from the job can not only contribute to low employee morale, it can take a serious toll on your employee’s health. A good, responsible company should value the health of their employees. And an even better leadership team will take the steps to create an employee wellness program that encourages their employees to live a healthy, balanced life. What Should Your Employee Wellness Program Include? What exactly is an employee wellness program? Below is a list of different categories for a successful employee wellness program. While some companies have the perks of on-site gyms or fitness classes, that is not feasible for most. What is feasible, however, is reimbursement of gym memberships. Some employee wellness programs also invite employees to submit their Fitbit, or other fitness tracker data to create contests and incentives for employees’ activity levels. To keep any colds or illnesses isolated, it’s important your employees know that it’s preferred they work from home or take a sick day if they are symptomatic of any illness. Some employee wellness programs offer flu shots during the winter. It’s also a great idea to stock healthy snacks and drinks in your office. Stress is inevitable at any job, but it can also be the silent killer of morale, productivity and overall health. It’s important to encourage your employees to take time for their personal lives so they don’t experience burnout or mental health distress. Some employee wellness programs include in-office massages by a licensed professional on an annual basis. Other programs require an employee to take a day off if they’ve accrued a certain amount of PTO. Consider offering extracurricular activities for your employees to take part in, such as a book club or running club. Some employees may prefer to exercise alone, but others may be more motivated to get moving with a group. It’s important to give back to the community and after volunteering, many employees get a morale boost. Encourage your employees to give back to the community by organizing a volunteer day. Your employees can provide input on the charities and organizations they care about, so they feel even more connected to their community. Now that you know what your employee wellness program can consist of, here’s how you can make it happen. 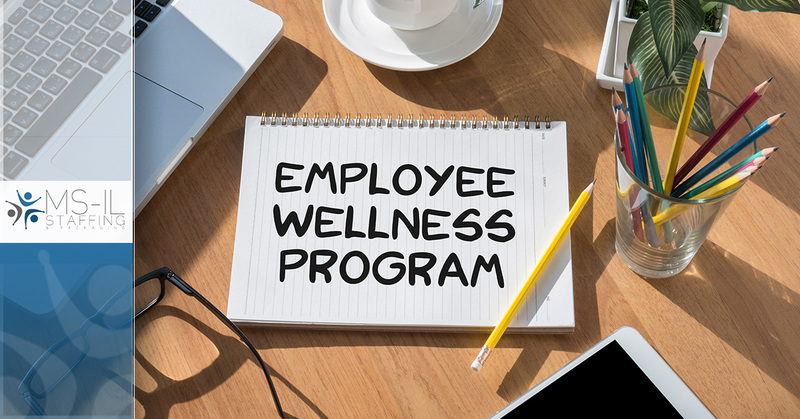 Be sure your employee wellness program benefits your employees as well as the company. Not only can each member of the team take on some responsibility, it will also ensure the program is serving the company as well as the employees. It will be similar to providing checks and balances. Once you have your team, it’s time to get to work! You must create a budget, delegate research and create a clear program. Once your program is created and approved, you can do a formal presentation with the entire company. This announcement will help encourage participation and is a great time to answer any questions. A successful program will evolve over time. Be open to feedback and changing health trends to keep your employee wellness program attractive and effective. Looking for more ways to create a healthy company culture? If you are interested in learning more about implementing your employee wellness programs or other ways to encourage positive company culture, contact MS-IL Staffing & Packaging.